The weather today screamed for soup - and so I made ramen. Saturday was a completely gorgeous day. I checked out two trails, had a turkey sandwich picnic, and cleaned out the garden. Home run of a day. But today I woke up to gross sleet hitting the windows followed by copious amounts of rain. So a nice hot meal was just what the weather ordered. I ended up making ramen for a few reasons. One of which was it seemed like a good use for my leftover mushrooms, spinach and carrots. 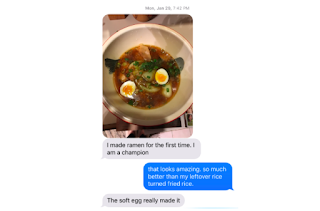 The second was my friend Meghan had made ramen recently and I could not get it out of my head. She totally knocked it out of the park. It is a phenomenal dumping ground for all the vegetables in your fridge or freezer. I could have made nearly this entire meal from my cabinets. All I needed was the actual ramen noodles. There is a difference between "easy ramen" and "ramen". I went with easy and while it was delicious it was just not as salty as ramen normally is. You need miso. I'm curious how this will be for leftovers. See this meal was for 2 people, but I am just 1. Let's see how that goes tomorrow night. Super fast! I think I had this pulled together in less than 20 minutes. Heat the sesame oil in a large skillet over medium low heat. Add the garlic and ginger; stir fry for 2 minutes or until soft and fragrant. Add the broth and the water. Bring to a simmer; add the mushrooms and simmer for 5 minutes or until the mushrooms have softened and the broth is flavorful. Add the instant noodles to the hot liquid and simmer for an additional 5 minutes or until the noodles have softened. Add the scallions and stir to combine. In a skillet, drizzle sesame oil and toss in some panko flakes. Saute until the panko flakes toast to a light brown. Portion the ramen into bowls and top with crunchy panko crumbs and pea shoots. I was headed to the grocery store this weekend rather casually and figured I should grab something for dinner. In an effort to prevent a lot of aisle wandering and salty snack purchases, I grabbed a sticky note to make a list. And in that minute I dreamed up this recipe for a seared fish with crumbled prosciutto. In that dream, I also added balsamic glaze but I held back in real life. I'll admit that the fish was not the best that I've cooked. The Trader Joe's frozen fish filets are not super evenly cut so they didn't cook that well in the pan. Hindsight? I should have baked them. But... the killer part? The prosciutto crumble. I will absolutely be using this again in the near future. It is so versatile and could be part of many recipes. Or maybe I'm just thinking of my mom's parmesan chicken. I could also see it as part of some tasty garlic toast. Set 3 pieces of prosciutto in a medium skillet. Remove from the heat when the prosciutto begins to crisp up. Add prosciutto to a food processor with mixture of parmesan and panko flakes. Probably like 1/3 cup each. Pulse to combine. Set your skillet to a high heat with a bit of butter. Pat dry your fish with a paper towel and then press into a dish of flour and breadcrumbs (About a 50/50 ratio). Flip and press in both sides of the filet one or two more times. Add the fish to the skillet and let cook for about 3-4 minutes on either side depending on thickness. This fillet was pretty varied in thickness so that was challenging. Remove when the fish flakes as you fork it. Need more information? Google how to cook white fish. Put your parmesan prosciutto mixture in a skillet over medium heat. Drizzle with olive oil and let cook until it begins to toast. As it cooks, use a spatula to break up the pieces to help it cook evenly. Remove from the heat. Plate your fish over the fava beans. Sprinkle heavily with the prosciutto crumble. Drizzle with olive oil and toss a few capers on the plate too. Enjoy! I will always be a meat lover - but I do enjoy the challenge of crafting good meals without any meat. And meatballs have always been one of my favorite meals. There is something so incredibly comforting about meatballs for dinner. They used to be one of my favorite "after work, when I lived in the city" dinners. I only add those caveats because for some reason I haven't made a big ole batch of meaty, salty meatballs since I moved to the burbs. Last week I saw this recipe for lentil meatballs on Instagram. Jillian Harris was raving about how amazing they were and perhaps how you wouldn't even miss the meat. While I'm not sure that is totally true, if I was a vegetarian this would be a good substitute and a fresh take on leftover lentils. Also - lentils are crazy affordable so let's start using them in lots of places. The meal comes together very quickly provided you already have the lentils made. I've never been great at cooking grains so just before I mentally prepared myself for cooking lentils, I googled whether I could make them in a rice cooker. Turns out you can - mostly. They weren't the best lentils of my life but for those of us that are especially challenged at grains.... it works just fine. Also, I'll absolutely be rolling all future meatballs in parmesan. It was super easy and cut back on the amount of cheese that I would actually put in a normal recipe. Also here are some previous meatball recipes: escarole and meatball soup, sage and parmesan meatballs, scallion and ginger meatballs, tender ricotta meatballs, and the ole traditional meatballs. Heat a small skillet over medium heat. Once skillet is hot, add olive oil, shallot and garlic. Sauté for 2-3 minutes until slightly golden then remove from heat. In a food processor, combine the egg, Italian seasonings, parsley, tomato paste, salt and pepper. Then add in the sauteed garlic and shallot as well as the parmesan cheese. You don't need to pulse until it's pureed just get these things combined. Add your cooked lentils to the food processor and mix until combined. Again, not pureed but just combined. But honestly don't stress about it. Remove the mixture to a bowl and then add in bread crumbs to get the mixture to the texture you need for rolling the balls. The mixture will be loose and very light but you should be able to get balls formed. I added about 2 tbsps of breadcrumbs but this will vary based on the moisture in your lentils, eggs, etc. Roll tablespoon sized balls into shape and then coat in parmesan cheese. Arrange on a baking sheet. Bake for 15-20 minutes until the balls have a gentle brown exterior. Remove meatballs from oven and let cool slightly - they will firm up the longer they are cooled. Serve over some form of pasta with a marinara sauce. It feels like everything I've been making recently has chick peas. When I went to the grocery store this weekend, I bought four cans of chick peas. So I need to find a way to pull back on this and add in some other substitutes. But in the meantime, this moroccan turkey stew is delicious. I found the recipe on the same website that I discovered the spaghetti squash primavera and tomato chick pea soup. While it isn't exactly low in sodium, it is delicious. I pulled it together in very short order after a pretty busy Sunday. The original recipe called for using a slow cooker which I wasn't interested in doing. If I was already going to brown the meat in skillet, I might as well just cook the whole thing in one pot and call it a day. I'll admit I was a little apprehensive about the spices as I was adding them to the pot. I don't think I've ever used more than a pinch of paprika... never mind 2 teaspoons. But it is so tasty - so just toss caution to the wind and make this soup. Here's how it goes. Heat olive oil in a large soup pot to medium-high heat. Add in the diced onion and garlic. Saute until onions melt down become more translucent. Then add in the carrots, celery, and pepper. Cook for about 5 minutes or so. Add in the ground turkey and break up the meat. Cook until you no longer see pink meat. Add in diced tomatoes, chick peas, spices, broth and gently mix well. Cover and simmer for about 30 minutes or so. The longer you let it simmer the more the flavors will develop.